Everyone is open to welcome you to Geelong After Dark. We love that our town has been redefined as an arts and culture capital. As Australia’s only designated UNESCO City of Design, Geelong After Dark contributes to our mission of placing art at the heart of all we do. But we don’t do it alone – our cultural venues turn on lights, throw open doors and invite you to be a part of it all. Geelong Performing Arts Centre; Geelong Library & Heritage Centre; Geelong Gallery; Back to Back Theatre; Courthouse Youth Arts and the National Wool Museum join Westfield Geelong and Market Square in the Amazing Arts Adventure, a race around Geelong to solve the art clues on the card. Once all clues at all venues have been solved, you can drop the card off at any of the participating venues to go into the draw for some Amazing Prizes, courtesy of our venues. GPAC: Four tickets to see Precarious by Circus Oz. NWM: family pass to the opening of the upcoming Playschool Exhibition featuring The Justine Clarke Show, Wednesday 3 July at 11:45am. As well as the Amazing Arts Adventure, the venues put on separate, immersive and mostly interactive pieces that are designed to Heighten Your Senses. Geelong Performing Arts Centre will have some Seaside Adventures with Fava Productions providing the seascapes. Geelong Library & Heritage Centre features a whole range of projects, from Portraits of Justice by the Youth of Geelong (in conjunction with Geelong Illustrators and Barwon Community Legal Service); Arty Karate After Dark; Wadawurrung Walking with Waa Screening and music music music! Impromptunes (direct from their 2019 Melbourne International Comedy season); Callum Watson’s Boom Box requests; and Andy Howitt’s Juke Box Senses. Geelong Gallery will feature projects aligned with the current Sidney Nolan Exhibition and sets by DJ Dean Turnley. Kids Activity Stations will be set up for your little ones to indulge their creativity and Mums and Dads can indulge in refreshments from the Pop Up Bar & Café. Mountains Rise will be situated at Back to Back Theatre and out the front of the National Wool Museum, you’ll be Chasing Fireflies with The Indirect Object. There is are so many projects that will bring the heart of the City alive next Friday 3 May. Rug up, check out & download the programme or grab a programme and make your way through the heart of our town to Heighten Your Senses. Tonight’s the night! After many months of planning and creating, Geelong After Dark arrives tonight to transform Central Geelong. Artists are finessing and tweaking, venues are ready and activities are being set up in preparation for The Big Reveal. With more than 70 arts activities taking place inside venues and outside in the streets and laneways, parks and public spaces, Central Geelong is set to come alive. Here’s a few tips to make sure you get the best out of your night. Dress for the cooler conditions to fully enjoy all the activities indoors and out. Layers are always a good idea. Plan your parking (or find a friend and share the ride). There are more than 4700 off street car parks and 5400 on street car parks in Central Geelong. On street car parking in central Geelong is free after 5.30pm. The Civic Centre Carpark opposite City Hall is free after 6pm and open until 1.30am. Parking is also available at Market Square and Westfield shopping centres, however hourly rates apply and don’t forget to keep an eye on closing times. Pick up your paper program from the official Geelong After Dark Info Point on the corner of Little Malop and James Sts, participating venues or our plan your visit to by selecting your zone (there are 3 zones this year) or better still, just rock up and go with the flow! Keep the kids interested with The Amazing Arts Adventure. Collect your card from Geelong Performing Arts Centre, Geelong Library, Geelong Gallery, Courthouse Youth Arts, Market Square, Westfield or the National Wool Museum. There are great prizes to win! Enjoy a bite or a beverage at one of the city’s many eateries. Little Malop St has a great selection of bars, cafes and restaurants - but don’t linger too long or you might miss something. Stay for the Gathering of the City in Johnstone Park at 9.30pm. Welcome Canoe and the Mountain to Mouth walkers in to the park for some much needed nourishment and to celebrate the end of the first day. Warning: there will be smoke and fire. Be a social butterfly! Take photos and share your experience by using the hashtag #instagad2018. 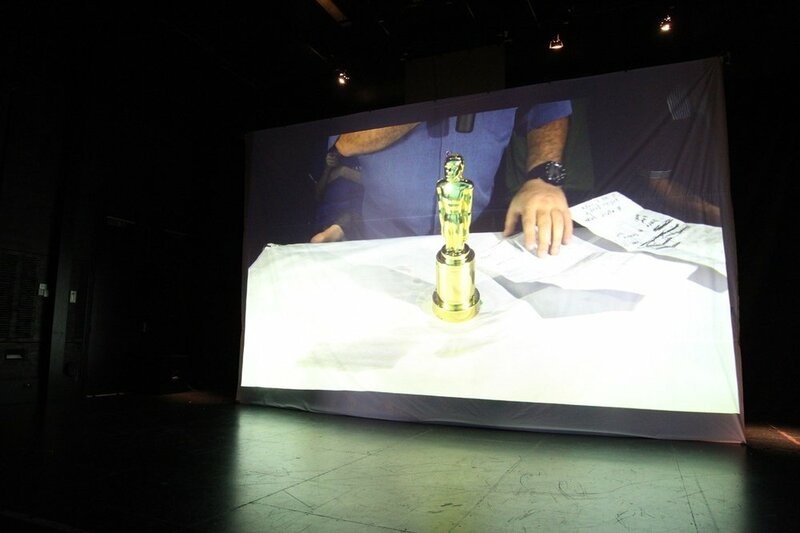 Look out for your photos on the big screen in Police Lane, between GPAC and Back to Back Theatre. Stick around for After After Dark. When the little kids go home, it’s time for the big kids to play. Head to Little Malop St (between Gheringhap and Moorabool streets) to join in the action. Can’t wait to meet you after dark! One more sleep until Geelong After Dark takes over the city! We’re not the only ones excited about this, in fact people coming from far and wide to experience Geelong’s biggest night of arts. A big shout-out to all those travelling long distances to be here, we can’t wait to meet you after dark! Wherever you’re coming from, you won’t be disappointed at the wide and varied program. Feeling snoozy at the end of the week? Get tucked in and take a nap as Joel Carnegie takes you to Dream Town and back. This interactive experience is on the Customs Lawn from every 15 minutes until 9pm. Not everyone likes the same music right? Come along to the Silent Disco in Little Malop St and dance the night away with headphones or without. Enjoy the effect of everyone singing and dancing to their own beat. The fascinating story of the Celtic Sea God Mannanon comes to life in Lantunda, a community arts project in Johnstone Park. The rotunda will transform into a glowing lantern from which images with dance and play to create a world of colour, shadow and light. Pop in to Back to Back Theatre (enter via Police Lane) and hear about the secret hobbies, collections and obsessions of members of the Geelong community. Single Channel Video highlights the value certain objects bring to our lives. Check out Joel Zika’s disruptive projection Caisson in the Barwon Water forecourt. From key vantage points the work creates a troupe l’oeil that changes the way people view and interact with the space. There’s also plenty of activity in and around the city’s cultural venues including the Geelong Library, Art Gallery, Performing Arts Centre, Courthouse and the National Wool Museum. The Carousel on the Geelong Waterfront will be open from 6:30pm to 8:30pm. 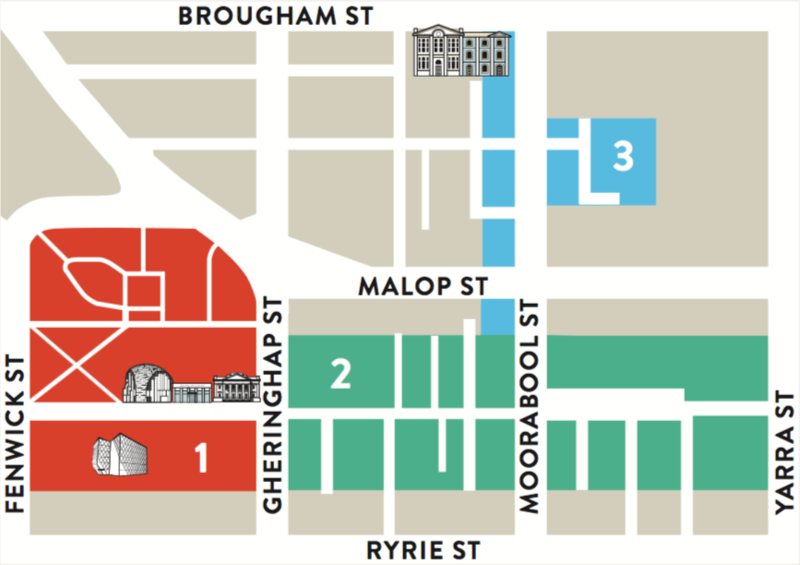 And don’t forget, this year’s Geelong After Dark includes an extended program centred on Little Malop St (between Moorabool and Gheringhap streets). Catering for the big kids, After After Dark extends the Geelong After Dark experience from 10pm including interactive performances, music, projection, street theatre and dancing. So whether you’re a local or a visitor, we hope you discover something new in Central Geelong. This year’s Geelong After Dark has plenty of surprises in store for those who like to stay out late. When the family-friendly activities wind up around 10pm, Geelong After After Dark takes over. 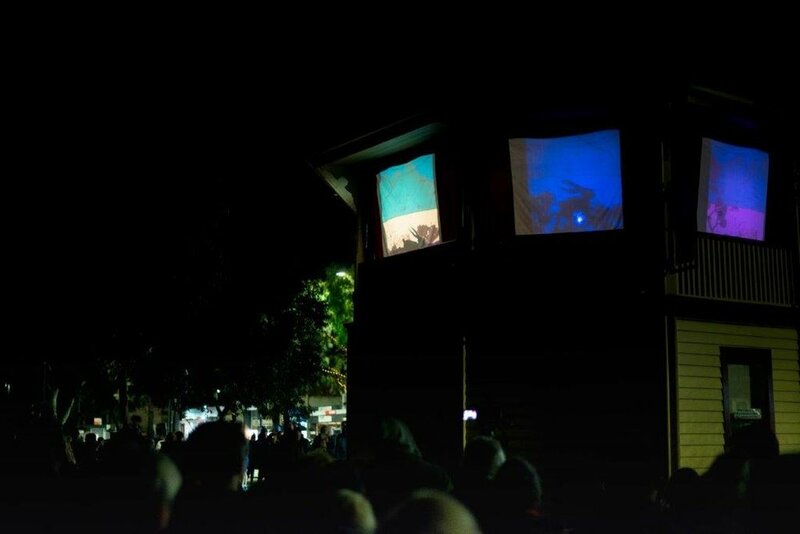 Night owls looking for more edgy arts action can explore what’s on offer in Little Malop Street (between Moorabool and Gheringhap streets) with interactive performances, music, projection, theatre and dancing until 11pm. Among the highlights, Beav’s Bar will become a portal for patrons to express themselves beyond gender lines. Embark on a duet with the mysterious Mx.Red (pronounced Mis Read), but you must be invited! Mx.Red is from another dimension, created by artist Jonathan Homsey using motion capture technology, augmented reality and live performance to create an experience of dance, expression and intimacy. Homsey is an award-winning artist born in Hong Kong and raised in the United States. He moved to Australia in 2010 and now works as an arts maker and manager interested in the intersection of street dance, visual art and social engagement. Mx.Red is one of two exciting and interactive works Jonathan will present at After After Dark. Discover the true nature of the gnome with Gnomeless a roving multimedia installation created by Geelong artists David Dellafiora, Sue Hartigan and Teresa Lawrence. Dimly lit, of earth and stone, the gnomes are diseased and despised guardians of the underground. A limited edition of The Small Issue will be offered to those able to see the true nature of the gnome. 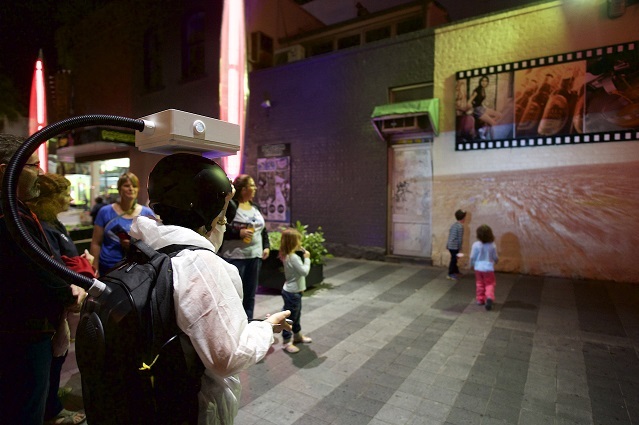 Transport becomes art at Geelong After Dark as the The Little Projector Company returns with its much loved Projector Bike - a cinema on wheels. And this year’s program includes a newcomer to the region, BOE’s Audiocycle, an interactive bicycle built from salvaged items that uses people power to share music. Pixel Alley will be transformed with a dazzling array of colourful patterns and sequences (actually you won’t be be able to miss it). This beautiful installation - the creation of design collective John Fish - features 1344 suspended LED spheres transforming an unassuming alleyway into a mesmerising display of light and colour. Street art and projection come together in Shorts Place, just off Little Malop St, where an 8m high artwork from highly regarded Baby Guerrilla will be overplayed with projection by Olaf Meyer. Baby Guerilla’s permanent street art project explores the relationship between people and virtual world. Meyer has digitally mapped the artwork and will bring a child to life exploring amazing virtual worlds. Theatrical experiences will include Bonkel Theatre Company’s The Way We Were, using original music and puppetry to explore the rise of capitalism in the 20th Century while local artist Liz McGrath will bring to life the fascinating true story of Miss Drysdale and Miss Newcomb, lady squatters. And if that’s not enough, street bands, dancing, installations and even live painting will keep audiences enthralled. Come along and immerse yourself in the diversity of works on offer at Geelong After Dark 2018 - it’s one of our biggest (and longest) events yet - putting the art in the heart of Central Geelong since 2014. With just weeks to go, the countdown is well and truly on to Geelong After Dark 2018. This year’s event celebrates Earth in all its glorious interpretations and creative imaginings. Now in its fifth year and with more than 70 activities - many of them created by local artists, groups and collectives - this is one of our biggest After Darks yet! From 6pm on Friday 4th May, city streets, laneways, parks, public spaces, street corners, vacant shops and venues will be teeming with earth-inspired performances, soundscapes, storytelling, music, dancing, illuminations, projections and all things arty. Geelong’s cultural organisations are gearing up for a massive night, with activities taking place in the Geelong Library and Heritage Centre (the Dome as locals know it), in and around Geelong Performing Arts Centre, the Geelong Gallery and National Wool Museum (just don’t get caught in the web!). City Hall will be transformed with projections, a giant lantern will illuminate Johnstone Park and Barwon Water’s courtyard will change the way you view a grey brick wall. And it wouldn’t be After Dark without the The Amazing Art Adventure, taking kids and parents on a journey of discovery, through the city where they’ll find bugs, beetles and bees, make their own glow worm and explore the world of owls. This year also sees Mountain to Mouth - the award winning 80 km extreme arts walk - intersect with Geelong After Dark. Choirs will sing in the ephemeral Canoe as it travels along Gheringhap St to Johnstone park where the Gathering of the City will take place around 9.30pm. In fact there’s so much going on, we’ve added an extra hour of activities. After the main program winds up around 10, head to Little Malop St for another hour of fun - we’re calling it After After Dark (but more about that later). Program highlights are currently being released on the website and the full printed program will be available very soon to help you can plan out your night. Or if you prefer, just come along and see where the mood takes you. It’s all free, it’s great fun, so mark it in your calendar and make Geelong After Dark 2018 a great night out in central Geelong. COME VOLUNTEER AND GET YOUR FEET ON THE EARTH AT GEELONG AFTER DARK ON FRIDAY 4TH MAY 2018! GAD ZONE WARDEN ASSISTANTS – Help with set up and pack down of sites within the zone, and care for needs and safety of visitors to the zones. GAD EVENT RUNNERS – Act as runner for Zone Warden and artists. GAD PROMOTIONS VOLUNTEERS - Hand out programmes in Central Geelong before and during the event. Submit your details by completing the online form here (We’ll be in touch with you to talk about your role). Attend a Volunteer Briefing Session (essential) before the event (dates and times to be announced). 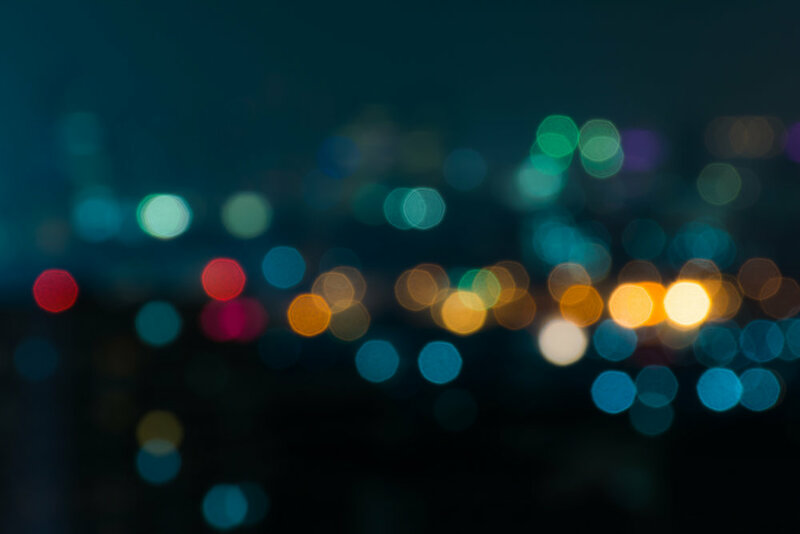 An exciting opportunity for a creative and dynamic producer to build on the success of Geelong After Dark in 2018, and reveal central Geelong through the arts. The City of Greater Geelong is seeking a passionate, visionary and dynamic Creative Producer to develop and deliver an arts activation programme that brings the city alive with edgy, contemporary artwork and performance that pushes the boundaries of artistic practice. 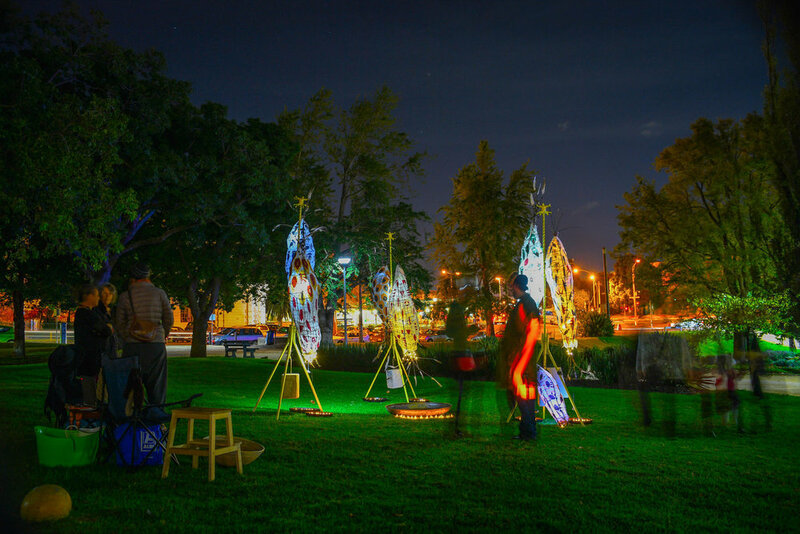 Discover Geelong After Dark through The Amazing Arts Adventure. Children will love this fun and interactive journey of discovery through central Geelong. Complete all tasks and go into the draw for some amazing prizes! Collect your entry form from any of the participating venues. Don’t forget to submit your completed card and any of these venues by 10pm to go into the draw for some amazing prizes! Don't miss out! Here's a list of all The Arts Amazing Adventure events. Myer Geelong proudly supports The One Million Stars to End Violence project Geelong area contribution. 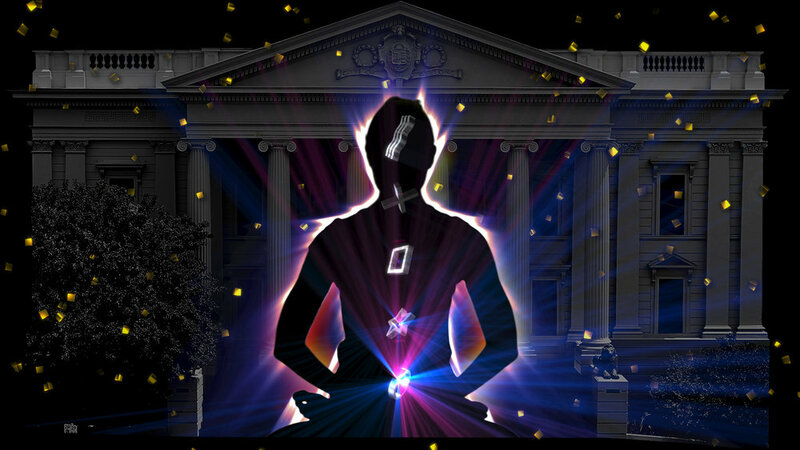 Come and peer into a window full of stars that fade into an infinite starry night sky, a dazzling illusion created by local artist, Jasmine Grace. Three unsigned artists teamed up with three experienced music industry mentors to write a song about a place in the Geelong region: that’s the premise of Connecting Song, a City of Greater Geelong initiative to support up and coming songwriters. Jeff Harwood, Tex Miller and Shaun Fogarty were selected from a pool of Geelong’s hottest new talent to work with music industry heroes Adalita (of Magic Dirt fame), blues and roots musician Tim Neal and hip hop artist Trem One. After months of solid songwriting, recording, mixing and creating videos, their work will debut in the secret garden next to Beav’s Bar at Geelong After Dark on Friday 5 May. Connecting Song is one of two festival contributions from the City’s Mountain to Mouth (M~M) project, aimed at building on the concept of a contemporary song line. Another highlight will be M~M’s Constellation - River of Words, a stunning installation at City Hall by Matt Bonner and Esther Oakes. Constellation will transform City Hall into an enchanting riverscape of possibility. Viewers will enter through a pathway of illuminated books to find a flowing river of words, bringing the City’s Our Future – 30 Year Vision to life. Geelong After Dark will illuminate central Geelong from 6-10pm with edgy art, interactive performances, spoken word, projections, illuminations, live music, soundscapes and exhibitions. Up to 20,000 residents and visitors are expected to discover (or re-discover) the city in a whole new light, with 370 artists participating and more than 80 short, sharp, edgy art activities to experience. 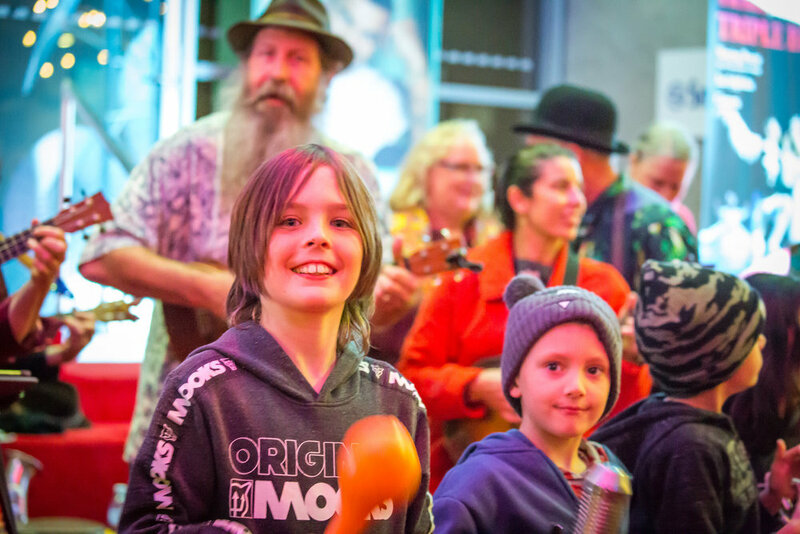 Geelong After Dark is a free, family-friendly event, with children encouraged to join in The Amazing Arts Adventure, an interactive journey of discovery through central Geelong. This multi-award winning annual festival is organised by the City of Greater Geelong with creative production by Diversitat. Central Geelong is doing it again! Get set for even more edgy art, interactive performances, spoken word, projections, illuminations, live music, soundscapes and exhibitions when Geelong After Dark returns on Friday 5 May. From 6.00pm to 10.00pm the city’s laneways, streets and venues will be transformed for one very surprising night of extraordinary and unique art experiences. 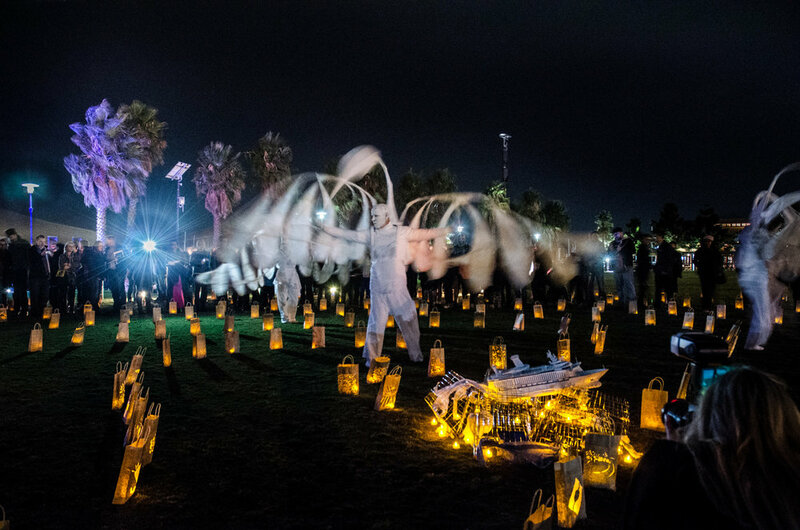 Geelong After Dark has grown each year since its inception in 2014, with 15,000 people attending last year’s event and more than 270 artists participating. This year’s Geelong After Dark will see a whopping 370 artists participating and more than 80 activities to discover throughout central Geelong. The response from artists and groups wanting to participate in this year’s event has been mind-blowing. This year’s theme is ‘The Sound of Light’ and the program will include a beautiful installation at City Hall which will bring Our Future – 30 Year Vision to life. Children will be encouraged to join in The Amazing Arts Adventure, an interactive journey of discovery through central Geelong. Another highlight will be The Storytelling Machine, an interactive media artwork that instantly transforms the public’s drawings into animated characters. Audiences are directly involved in the creative process and become part of a collective story in this unusual interactive technology experience. We’ll share more highlights over the next few weeks, so stay tuned!